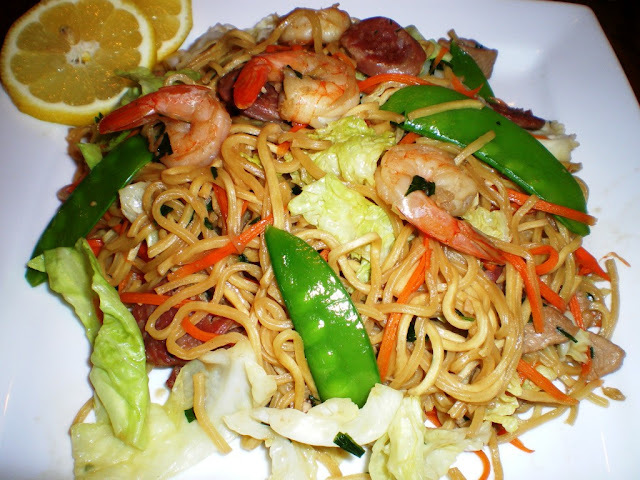 A favorite noodle dish to which meat and vegetables are added. Named after the city of Canton, but chances are, you won’t find this dish there. 1 In a small bowl, mix the shrimp with the egg white and 1/2 tablespoon ofthe cornstarch. In another bowl, dredge the chicken strips in the remaining cornstarch. 2 Heat the oil in a wok or saucepan and stir-fry the garlic until golden brown, then stir-fry the onion until translucent. Add the chicken and mushrooms, and stir-fry for a few minutes. 3 Season with the fish sauce and pepper. Add the shrimp and chicken livers, and stir-fry briskly for 2 minutes. 4 Add the stock, increase the heat and bring to a boil. Add the carrot, celery and dried noodles, and cook until the vegetables are done and the noodles are al dente, about 4 minutes. Then thicken the sauce with the cornstarch. Serve on a platter surrounded with lime halves.